Two gunmen, one confirmed to have declared his loyalty to ISIS, opened fire on a free speech event in Garland, Texas on Sunday night. The liberal media were quick to the blame the organizers of the event—specifically Pamela Geller, the president of the American Freedom Defense Initiative—for provoking the attack with a cartoon contest featuring the Muslim prophet Mohammed. 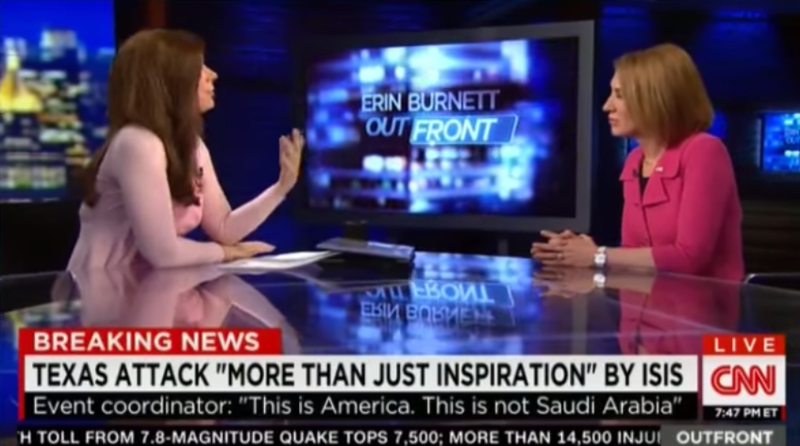 CNN’s Erin Burnett pressed one of the newest additions to the 2016 GOP primary, Carly Fiorina, to condemn Geller for supposedly knowingly and even purposefully inciting violence by jihadists. “Well it clearly was provocative, just like white supremacists demonstrating is provocative,” Fiorina said. “But you would agree with that? With white supremacists?” Burnett interjected. “So we can say this was a provocative gathering. I think that’s true. I think it’s fair,” Fiorina said. Burnett then tried to push Fiorina into saying that Pamela Geller should not have held the cartoon contest knowing that it would offend Muslims. “A lot of people do things in this country that I don’t agree with—that I don’t approve of,” Fiorina replied. “But nevertheless, in this country, they’re free to do it,” she said. Check out her remarks below.